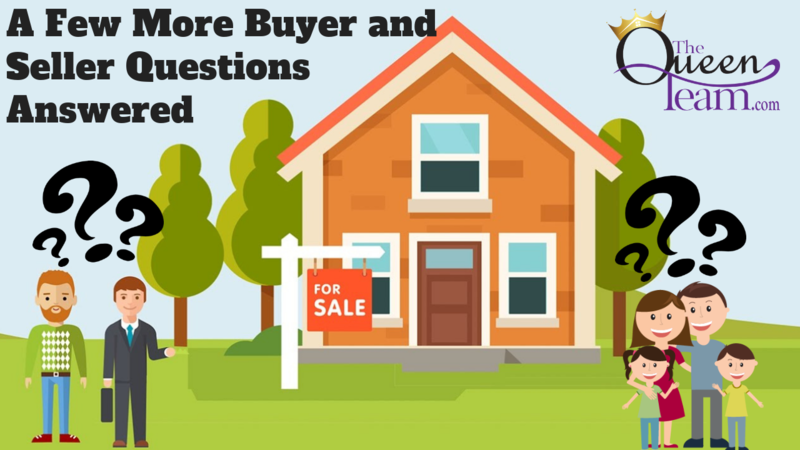 I have five more common buyer and seller questions I want to answer with detailed explanations. Here are a few more common questions I get from buyers and sellers ad my answers to them. I accepted an offer, but now I’m wondering if I could have sold for more. Can I keep looking at other offers? Sellers never know how long a particular buyer has been on the market. It could be that they’ve been looking for a while, and it’s because you’re just now coming on the market that you’re getting an offer pretty quickly. A lot of times when sellers get an offer quickly, they wonder if they priced their home too low. That’s not necessarily true. Sometimes it just means you priced your home exactly where it needed to be for that right buyer at that right moment. Once you accept an offer, you can continue to show your home, place it under “Pending, continue to show” status, and accept other offers. However, even if you get a cash offer, you can’t move forward with it unless the previous buyer cancels their contract or defaults in some way. While it’s a good idea to continue showings in case you have backup offers, any backup offer depends on the whether or not the current offer you have closes. The seller didn’t disclose something about the property? Are they on the hook? It depends on what they didn’t disclose. Was it a defect that you can prove they knew existed prior to filling out the disclosure, something they didn’t know existed, or something that was apparent throughout the transaction and never caught? They’re only on the hook if they knew about something and didn’t disclose it. The answers to some of these questions vary on a case-by-case basis. This is the kind of question that varies on a case-by-case basis. Any issue would be addressed between each party and their agents. The buyer’s financing fell through before the close date. Can I walk away? If they can’t obtain financing in some other way, yes you can walk away. If their financing didn’t come through, it becomes a question of whether they’re taking action to come up with cash funds or get their financing in order to proceed with the closing. If neither is the case and they can’t move forward, the contract will be terminated. The inspection raised some issues I wasn’t expecting and the house appraisal doesn’t match the contract price. Can I back out of the deal? When it comes to the inspection, unless you’re purchasing a new construction home, you’ll probably find defects with the house. Some of these defects will be normal wear and tear, and others will be more high-dollar items, and those are the things you need to watch out for. When you do an inspection, you have to decide whether you want to negotiate with the seller to get them to fix certain things before closing, give you a credit to fix them after closing, fix those things yourself, or back out of the transaction. Again, the answer will vary on a case-by-case basis and depend on what your inspection entails. If you decide you don’t want to move forward, you’ll enter an option period where you can cancel the contract. What happens if the house isn’t appraised for what I’m willing to pay for it? There are a few different paths the transaction can go. The seller can lower the price, the buyer can make up the difference between the sale price and the appraised price, they can meet in the middle, or the buyer can walk away without penalty. If the house doesn’t appraise at the sale price, the seller’s agent will typically confer with them and decide on the best course of action. At that point, the buyer also has to ask themselves how much they really like the property. Our agents write often to give you the latest insights on owning a home or property in the Greater Houston area.